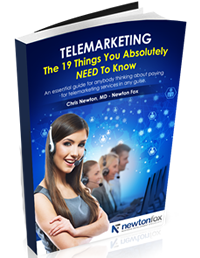 Hi all, so I have been asked to start writing blogs about what we do here at Newton Fox, and how brilliant and successful we are at telemarketing for companies and appointment setting. I figured the best way to do this was to just explain what I have been doing for the last couple of days for one of our biggest clients. Obviously I do not want to go into specifics about the client themselves, but when it comes to our telemarketing and what they want us to do here (which is set them appointments with the right people so that they can introduce their services) they have always been particularly helpful, making sure we have the warmest data that we can get hold of.